Gabriela Zayas Alom, an undergraduate from the University of Puerto Rico – Rio Piedras, just finished her 10 week summer program within our lab as a PREP (Psychological Research Experience Program) student. 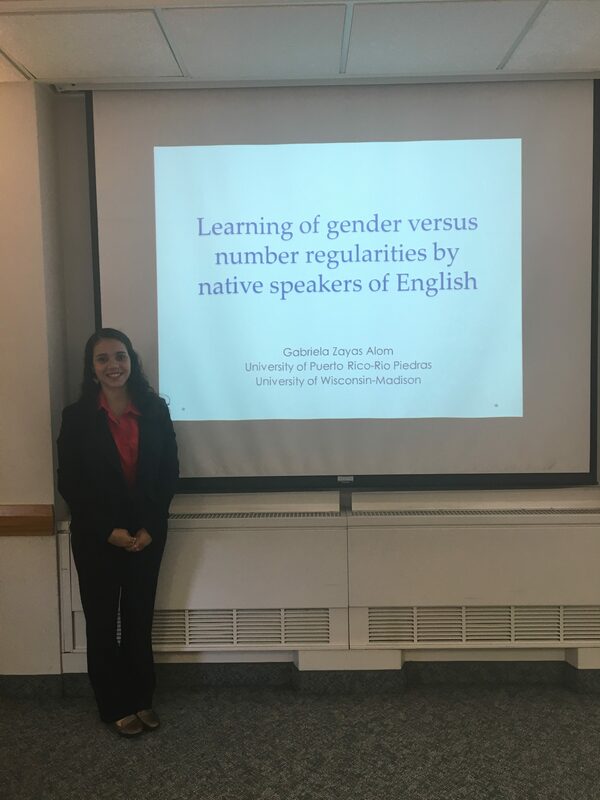 Gabriela presenter her project, titled ‘Learning of gender versus number regularities by native speakers of English’ at the PREP Symposium on August 5th in front of the Psychology department. The hypothesis for her study was that English speakers, whose native language has number but not gender, would consequently be better at picking up on number agreement errors than gender agreement errors in a newly learned artificial language. However, contrary to this hypothesis, she found no difference in gender versus number trials in the artificial language she used in her experiment. She did find an expected difference between adjacent and non-adjacent errors, with adjacent agreement errors being easier to detect than non-adjacent errors. Want to know more? Here’s the full research report.